U.S. Sen. Hillary Rodham Clinton said Thursday that more soldiers are needed to fight stepped-up attacks by Taliban militants, during a visit to assess Afghanistan's security and enjoy a Thanksgiving Day meal with American troops. In an interview at Bagram Air Base, outside Kabul, Clinton said the U.S.-led coalition must decide whether those additional soldiers are drawn from the American military, NATO or the armed forces of other countries. Security in Afghanistan "faces a constant challenge from the anti-coalition forces," Clinton said. "I believe we need more troops to be able to provide that security." Bagram Air Base is home to most of the 11,600 U.S.-led coalition forces in Afghanistan. An additional 5,500 international peacekeepers patrol the capital. Some 35 Americans have died from hostile fire in Afghanistan since the October 2001 start of the Afghan war, according to the U.S. military. The former first lady, who was in Afghanistan along with Sen. Jack Reed of Rhode Island on a whistle-stop tour, said the United States is impressed by the direction Afghan President Hamid Karzai is taking his country. She promised the United States will stand with Afghanistan as it tries to rebuild after a quarter-century of conflict, and warned Taliban rebels they "are fighting a losing battle." Reed, a former U.S. Army paratrooper who was on his second trip to Afghanistan, said that in some ways the desperately poor country has become America's forgotten war. "We let our attention wander from Afghanistan, and we lost the initiative," he told The AP. "We have to take more aggressive offensive operations." In all, about 50 American soldiers ate turkey, stuffing and pumpkin pie with Clinton and Reed. Some said that while they missed their families at home, they gave thanks that far fewer American soldiers are dying in Afghanistan than in Iraq. Clinton, who represents New York State, met at Bagram with members of the 10th Mountain Division, which is based in Fort Drum, New York. She later was to travel to another U.S. base in the southern Afghan city of Kandahar for a Thanksgiving dinner there, too. On Sunday, a U.S. transport helicopter crashed just after leaving Bagram in support of a coalition military operation in eastern Afghanistan, killing five U.S. servicemen and injuring eight. The cause of the crash is being investigated, but the Pentagon said engine failure might have downed the aircraft. 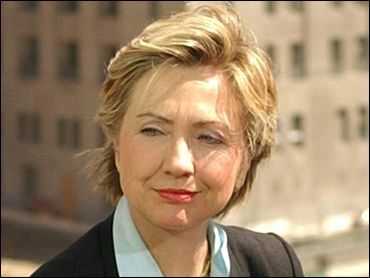 Clinton said Washington is concerned about a recent spate of attacks, especially in the south and east of Afghanistan. Suspected Taliban and al Qaeda have launched a ferocious campaign against aid workers, Afghan government employees and soldiers. More than a dozen aid workers have been killed this year, most recently a 29-year-old French woman working with the U.N. refugee agency who was gunned down earlier this month south of the capital. The killing has forced the United Nations and several aid agencies to pull international staffers out of large swaths of the country. "The U.S. is resolved to stand as a strong partner and to ensure that the terrorists, whoever they are, wherever they come from, will be dealt with," Clinton told reporters after meeting with Karzai at the Presidential Palace in Kabul. But, she said at Bagram, "it is hard to see how in a country this large with the challenges it faces we can expect to deliver the necessary security with the troop strength we have." Aid groups and the Afghan government have long been calling for an expansion of the NATO-led International Security and Assistance Force, which patrols the capital. NATO has agreed to expand the force, but individual countries have been reluctant to pledge troops.